The Euro advanced for a third consecutive day after mixed economic data showing Construction Output in the EU was down by 1.38% MoM in January vs 0.2% advance expected, while the yearly reading resulted at -0.7%. The German ZEW survey showed that Economic Sentiment improved by more than expected in March, resulting in -3.6 for the country and at -2.5 for the whole Union. The US published January Factory Orders at 0.1% MoM missing the market's expectations of 0.3%. Today, the US Federal Reserve will publish its latest monetary policy decisions, as the market is anticipating some downgrades and revisions in economic projections, particularly in future rate hikes, which is the main reason why the Dollar’s gains remain capped. 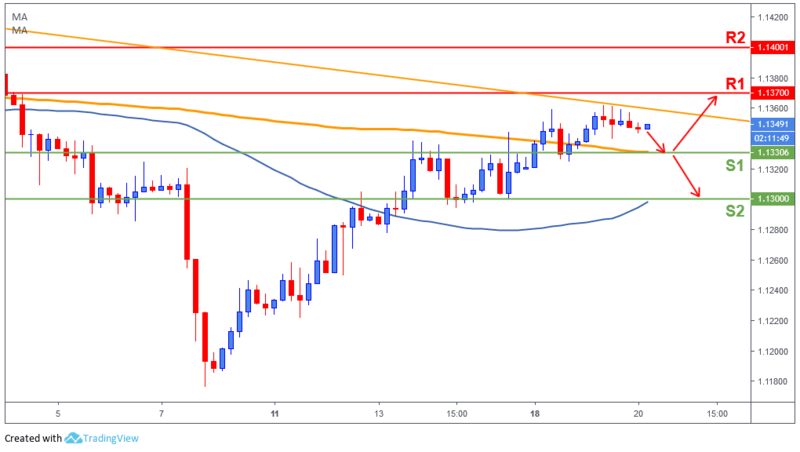 The Euro traded within a small range yesterday after price tested the 1.1360 down trend line (orange line), pulled back towards 1.1340s and settled for the rest of the day. Today the FOMC meeting will probably introduce volatility to this pair as price could either break above 1.1370 (R1) or below 1.1330 (S1) to confirm its next possible destination.